Short Synopsis: A one act sketch in which the vampire Dracula arrives at a strange farmhouse during a full moon. 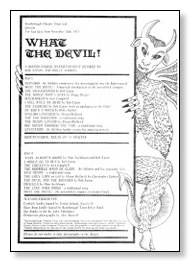 It was presented as part of the revue What The Devil! The Grey Plays are acknowledged miscellaneous minor pieces by Alan Ayckbourn, which have received limited performance but have never been published, are not available for production and are not included in the official canon of Ayckbourn plays.